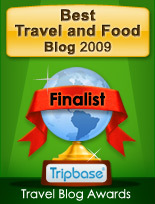 Chef Gwen has combined her wordpress blog with her website to create a more robust food blog. Pen & Fork (penandfork.com) is a food blog about cooking and eating — at home and in restaurants — and everywhere in between. Find recipes, cooking tips, cookbook reviews, kitchen tool finds and articles about restaurants, dining out and food travels. If you subscribe to penandfork.wordpress.com blog, please consider resubscribing to the new site at penandfork.com. Note from Chef Gwen: Just in time for pie-baking season (who am I kidding…every season is pie-baking season) Linda Avery returns with a review of the new Southern Pies cookbook, from the same author of Southern Cakes. After conquering the world of pastas and noodles, curries and mu shu, Nancie McDermott turned to sweets. Nancie authored seven or eight books on the cuisines of Asia, so I was surprised when, in 2007, she came out with Southern Cakes: Sweet and Irresistible Recipes for Everyday Celebrations. There was no surprised in the quality – or the high YUM factor – of those cakes. I specifically remember Cornelia Walker Bailey’s Pear Bread, a versatile, spice-infused batter that turned out tea breads when made in loaf pans or presented as a cake when made in a Bundt pan. And I wasn’t surprised to see another Bailey recipe in McDermott’s new book Southern Pies: A Gracious Plenty of Pie Recipes from Lemon Chess to Chocolate Pecan. This time, Bailey’s recipe is Sapelo Island Pear Pie – that lady loved the pears from Sapelo Island, Georgia. McDermott’s recipes are user friendly; she’s okay with store-bought pastry. Her research is evident and her headnotes span mini-biographies to historical accounts to Southern travelogue – all of which are intriguing. The book has a concise glossary for those who don’t know what a sonker is (the abbreviated definition is a deep dish cobbler with ties to Surry County, North Carolina) as well as a listing of sources for authentic Southern ingredients (mostly located below the Mason-Dixon line). “I came across Dr. Carver’s recipe several years back, during my research for “Southern Cakes.”. I was looking for Southern cakes using peanuts and was delighted to find that Dr. Carver’s writings included recipes using peanuts and sweet potatoes to use in the kitchen. Sweet potato pie is one of my favorites — if I’d had room for it in the book, I would have given sweet potato pies their very own chapter. I love this particular pie because Dr. Carver calls for slicing par-boiled sweet potatoes lengthwise and layering them into the piecrust, rather than mashing them up into a custard. He also cuts loose with the spices, calling for allspice, cloves, ginger and nutmeg, and includes molasses and cream, all giving this pie an antique aspect that makes me feel like I’m flipping the calendar backwards and carrying on good kitchen customs that got left behind over time. So take the time, enjoy the process and share with friends and family. When Dr. George Washington Carver wrote his Agricultural Bulletin #38 in 1936, his goal was to provide African American farmers with much more than just guidance for raising sweet potatoes as a cash crop and food source. Already in his seventies, and more than four decades into his work as a research chemist, botanist, educator, and author, he tirelessly presented practical, focused information on agriculture, nutrition, and business practices, so that his readers could choose crops that might bring them financial benefits as well as nutritional ones. His bulletins began with notes on agricultural varieties and how to plant them with success, then moved on to dozens of recipes, including several for sweet potato pies. This one is my favorite. Carver liked spices as much as I do, but if you don’t have all these in your pantry, you can simply season your pie with cinnamon, or a combination of your choosing. You could prepare this in advance by cooking the sweet potatoes and slicing them in one session, and then assembling and baking the pie the next day. 1. Line a 9-inch deep-dish pie pan with dough, draping it over the edge of the pie pan with a 1 1/2-inch border of pastry extending beyond the rim. Refrigerate until needed. 2. Place the whole, unpeeled sweet potatoes in a large pot with water to cover by 2 inches. Bring to a rolling boil over high heat. Reduce the heat to maintain a gentle boil, and cook until the sweet potatoes are tender enough to be sliced, but not so tender that they fall apart. Depending on their size and shape, this should take between 15 and 30 minutes. Remove any smaller sweet potatoes as they reach the right texture and let larger ones cook until they reach the correct texture. 3. While the sweet potatoes are cooking, prepare the seasonings. In a small bowl, combine the sugar, flour, allspice, ginger, nutmeg, and cloves. Stir with a fork to mix them together well. 4. In a medium bowl or a heatproof measuring cup, combine the cream and molasses. When the sweet potatoes are cooked, measure out 1/2 cup of their cooking water. Add this to the molasses and cream and stir to mix these liquids well. 5. Drain the sweet potatoes and set them out on a platter to cool enough to be handled. Peel and trim the sweet potatoes. Slice them lengthwise into slabs about 1/4 inch thick (see Note). You will need about 4 cups; enough slices to generously fill the piecrust. 6. Heat the oven to 350°F. Roll out the top crust to about 11 inches in diameter. Have the spice mixture, molasses mixture, and butter all ready. Place two layers of sweet potato slices in the bottom of the piecrust. Sprinkle about one third of the spice mixture over this first layer. Add another two layers of sweet potato slices, another third of the spice mixture, and finish up with a final two layers of sweet potato slices, filling the piecrust almost to the very top. Add a few slices of sweet potatoes to the center, to build it up a little higher. Sprinkle all the remaining spices over this third layer. 7. Pour the molasses mixture evenly over the filling (you may have extra, just use what you need), and place the bits of cold butter around the top of the pie. Cover the pie with the top crust. Fold the edges of the bottom crust up and over the top crust and press to seal them together well. Using the tines of a fork, work your way around the piecrust, pressing to make a handsome parallel design on the crust as you seal it. Use a sharp knife to cut eight slits in the top of the pie, so that steam can escape and the filling can bubble up through the crust. 8. Place the pie on a baking sheet on the center rack of the oven. Bake until the crust is nicely brown, the filling is bubbling, and the sweet potatoes are tender all the way through, 45 to 55 minutes. 9. 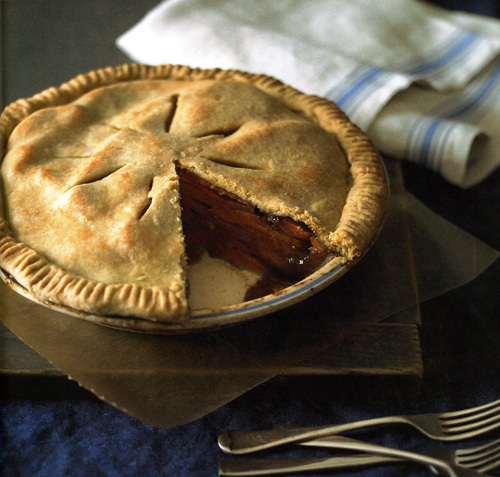 Place the pie on a cooling rack or a folded kitchen towel and let cool to room temperature. Note: You’ll slice the sweet potatoes lengthwise into “planks,” not crosswise into rounds. 1. In the work bowl of a food processor fitted with a metal blade, combine the flour and salt; pulse for 10 seconds. Add the butter cubes and pulse until the mixture resembles coarse sand with some small lumps, 30 to 40 seconds. 2. Add 3 tablespoons of the ice water and the vinegar and pulse 5 to 7 times, until the dough just barely holds together in the work bowl. Add another tablespoon or two of ice water if needed just to bring the ingredients together. Turn it out onto plastic wrap and pat the dough into two separate disks; refrigerate them for a least 1 hour. Set one or two disks out at room temperature for 10 minutes before rolling. 3. Roll out one of the dough disks on a lightly floured surface, to a circle about 1/8 inch thick and 10 inches wide. Carefully transfer it into a 9-inch pie plate. Press the dough gently into the pan and trim away any excess dough, leaving about 1/2 inch beyond the edge of the pie pan. Fold the edges up and over, and then crimp the edges decoratively. Or press the back of a fork into the pastry rim, working around the pie to make a flat edge marked with the tines of the fork. If not filling the crust soon, refrigerate it until needed. 4. To make the crust in advance, wrap it well in plastic and refrigerate it for up to 3 days, or freeze it for up to 2 months. Comfort food. It means different things to different people. I have a friend who thinks of fried chicken as comfort food. To be completely honest, she thinks of fried chicken, period. In her world, fried chicken is its own food group on the pyramid. 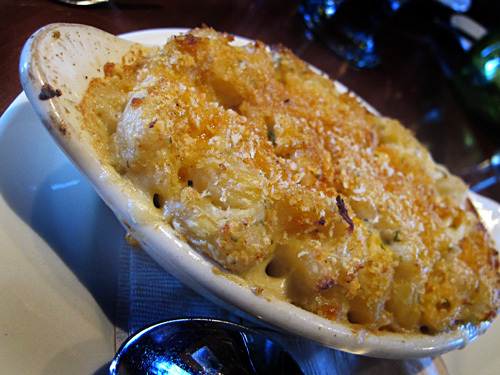 For me, macaroni and cheese is the ultimate comfort food. Like most people, I grew up on the blue box of Kraft mac and cheese. I’m all grown up now, and I want a better mac and cheese. I found one at ZOOM in Park City, Utah. It isn’t so gourmet that it loses the homey comfort of pasta bathed in cheese, but it’s gussied up enough to make the Kraft mac and cheese seem like child’s play. 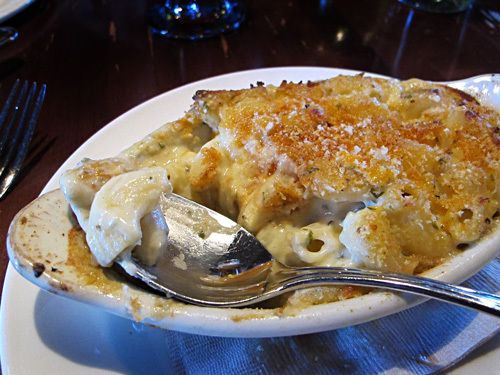 I love the fat, ribbed shells, the gooey, herb-flecked cheese sauce, and the crunch from toasted bread crumbs. I even found the recipe in a cookbook I bought. The book is called Park City Cooks: An Eclectic Collection of Park City Recipes. All the proceeds from the cookbook go to The Peace House, a non-profit organization that provides education, shelter and support services to women who are victims of domestic violence. The recipes are from members of the Park City community, and in the back of the book, there are a few recipes from the local restaurants, including this recipe from ZOOM. ZOOM is owned by The Sundance Resort (Robert Redford’s remarkable property about 35 miles from Park City). As I licked the plate clean, I thought to myself “I’d love to have that recipe.” And lo and behold, it appeared. I love when that happens. Now you can have it, too. Mix the breadcrumbs, Asiago and paprika in a medium bowl. Melt 6 tablespoons of butter in a large, heavy saucepan over medium heat. Add the flour and stir for three minutes. Gradually whisk in the milk, then the mustard and pepper. Cook until thickened, stirring often, about 1o minutes. Stir in the cheddar and parsley. 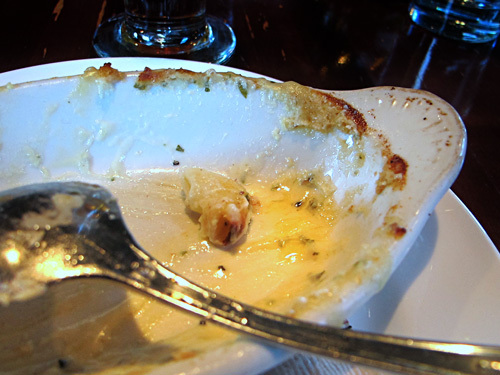 Heat the oven to 400 degrees F. Butter a 15″ X 10″ X 2″ glass baking dish. Cook the macaroni in a pot of boiling salted water until just tender, but firm to the bite, stirring occasionally. Drain the macaroni well. Return the macaroni to the drained pot; stir in the sauce. Season to taste with salt. Spread the mixture in the prepared baking dish. Sprinkle with the bread crumb topping. Dot with the remaining 2 tablespoons of butter. Bake until the cheese is bubbling and the crumbs are brown, about 40-45 minutes. Cool slightly before serving. UPDATE 10-4-10: We have a winner! Congratulations to Katrina M! A big, sweet thank you to all who entered. If you didn’t win, I hope that you’ll still come to the event. The entire ticket price goes directly to the two charities. Hope to see you there! 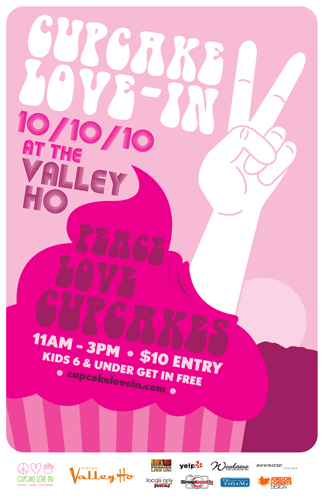 Did you read my last post about the fun-tastic charity cupcake event happening on 10.10.10 at Hotel Valley Ho here in Phoenix? No? Well, go read it (here)….I’ll wait. Meanwhile, I might shop for one of these Tees. Now you know that the Cupcake Love-In, co-founded by pastry chefs Tracy Dempsey and Kelly Garcia, is a charity event to raise money for Singleton Moms and Safe Haven for Animals, and you know that 33 Valley bakers are competing for best cupcake bragging rights. And there’s a cupcake eating contest and a cupcake decorating station for the little ones. And it’s all for charity. In the spirit of giving, I’ve bought 2 tickets to the event. To win both tickets, all you have to do is leave a comment, telling me your favorite cupcake flavor. That, and you need to be able to go to the event on Sunday, 10.10.10, from 11 a.m. to 3 p.m., at the Hotel Valley Ho in Phoenix. Barring natural disasters, broken bones, virus-infections, etc., you agree to attend the event if you win. Deadline is midnight (PST) Sunday, 10-3-10. 1 winner will be selected at random to receive both tickets, and will be announced on Monday, 10-4-10. So, go ahead. 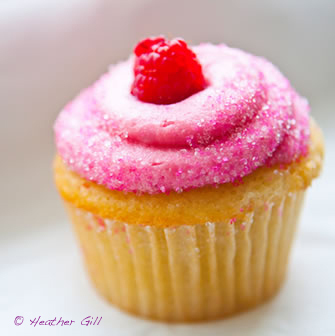 Tell me your favorite cupcake flavor. No, no, not here. Although, it is fetching, isn’t it? At least from the outside. But sometimes, appearances aren’t what they seem. 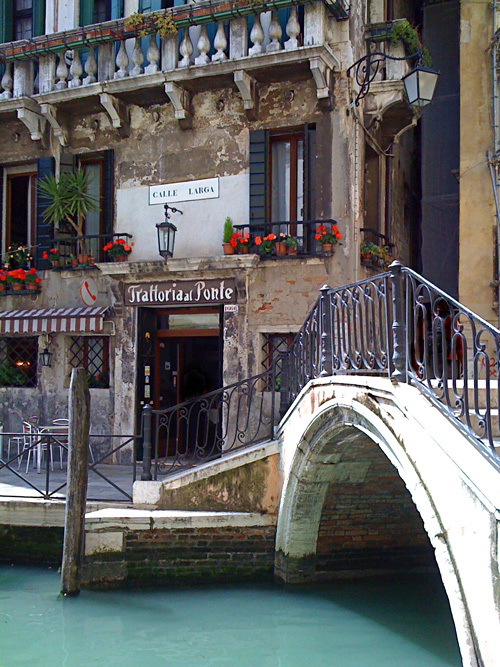 The fabulous restaurant I’m about to share with you doesn’t look anything like the idyllic Venice trattoria pictured above. 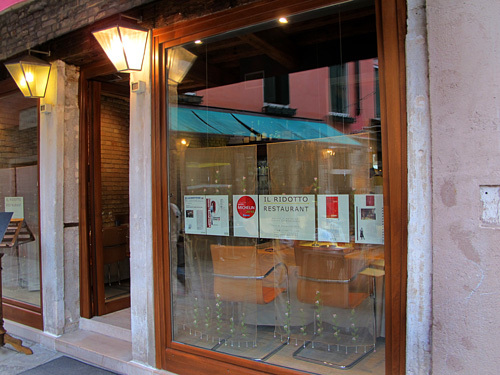 From the outside, Il Ridotto is rather nondescript. I’d even call it plain. The adage “don’t judge a book by its cover” — even though we all do — should have run through my head. I almost skipped it because it didn’t look like the charming restaurant above. I wouldn’t have given Il Ridotto a second thought if not for my Twitter friend, Sharon Miro (@nicklemoon), who’d just been to Venice a couple of days before we arrived. Sharon insisted we not miss Il Ridotto. I scribbled down the address and set off to have a look. I must have walked past it three times before I finally noticed it. In hindsight, it was one of the best (of many great) meals across our 21-day Italian Affair. What Il Ridotto lacks in “curb” appeal, it makes up for ten-fold by the charming interior and the exquisite food. Thoroughly Italian — yet it bears no resemblance to the old-school traditional Italian ristorante — Il Ridotto is nuovo Italian. 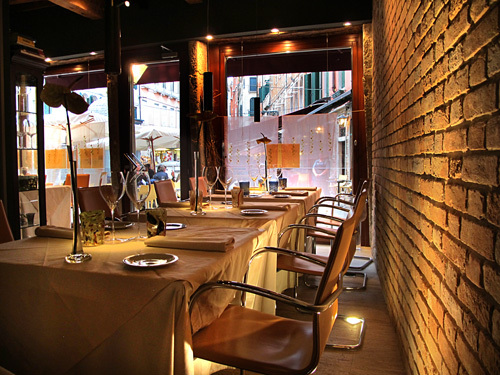 The small, 14-seat restaurant positively glows at night. Il Ridotto doesn’t open until 7:30 p.m., but the chef graciously opened at 7 p.m. for a couple of hungry Americans, and for half an hour, we had the whole place to ourselves. By the time we left, every seat was full, while a flock of foodies waited patiently outside. When faced with a choice between navigating a several-pages menu versus a chef’s tasting menu, go with the latter. Especially at Il Ridotto. 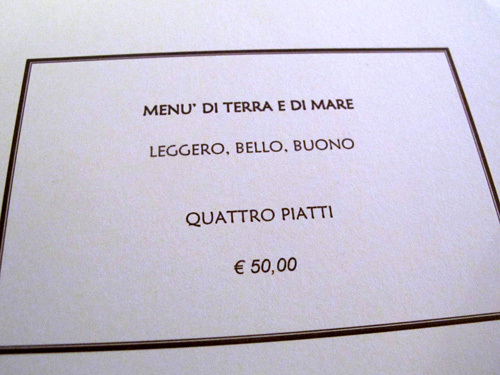 The tasting menu reads “menu of land and of sea / light, beautiful, good / four plates / 50 Euro. That’s it. No course descriptions. 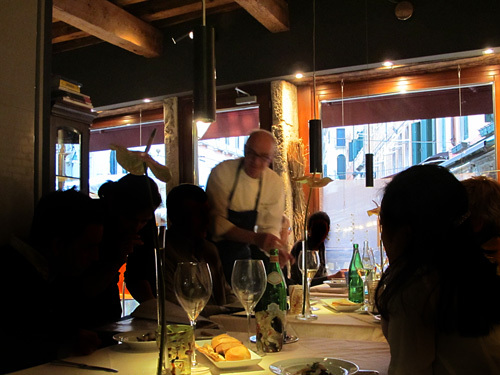 That’s because the chef, Gianni Bonaccorsi, a tall, thin, bespectacled man, comes to the table to discuss the menu. His halting English is charming, and he surprised me with his gracious manner. He apologized profusely for not being fluent. I assure you, that is not the norm in most Italian eateries, fine dining or otherwise. Using English peppered with Italian and lots of hand gestures, he said that he’d received some beautiful frutti di mare that morning, and would we be happy if he just sent out dishes? Who are we to argue with such a kind, stately chef? 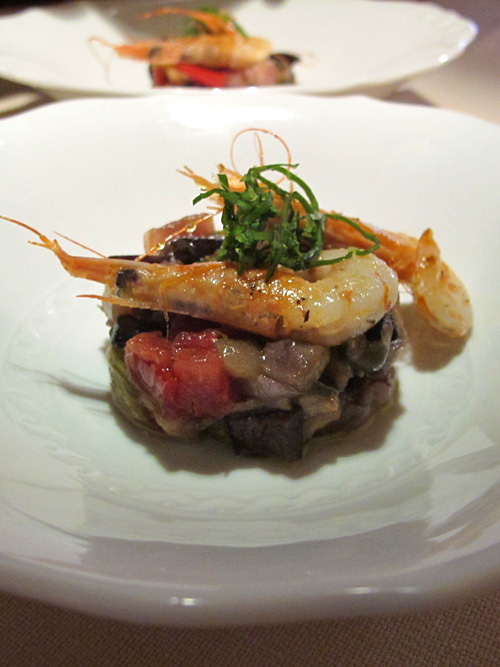 We both started with an amuse: two succulent shrimp on top of a sweet-sour caponata. The chef and one server manage all 14 seats. I’m not used to plates personally delivered by the chef, but I think I could get used to it, especially if the chef is as engaging as Bonaccorsi. Because there were two of us, the chef made sure that we sampled different dishes with each course. 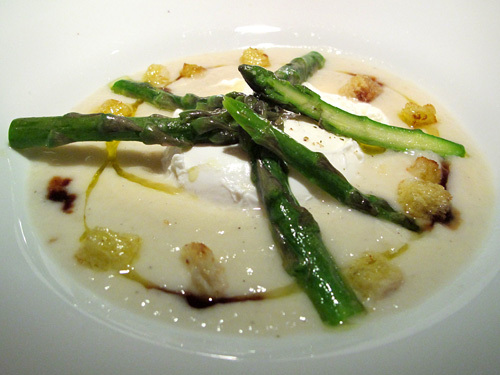 The first course was a white asparagus puree surrounding a mound of burrata and garnished with sauteed green asparagus, crisp croutons and a drizzle of olive oil and aged balsamic. 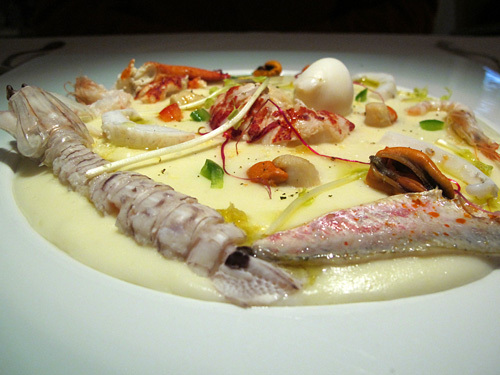 And the other, an eye-popping vision of the sea with lobster, mussels, clams, cuttlefish and canocce, swimming in a pool of silky potato puree. Canocce is an interesting sea creature. It has very little meat — it’s mostly exoskeleton. 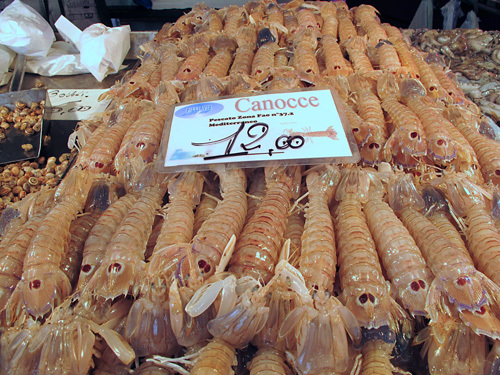 I saw the finger-shaped crustacean in several seafood markets, and first tasted it in a trattoria in Bologna, where it was chopped it into pieces and cooked in a Marsala cream sauce. But it was difficult to eat with the shell on. When I inquired how to eat it, the server mimicked Tom Hanks in the movie Big, gnawing on baby corn. 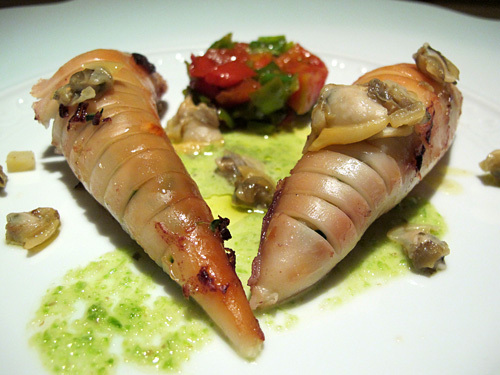 At Il Ridotto, Bonaccorsi shelled it whole (a difficult, time-consuming thing to do), leaving the head and tail intact. The taste and texture was a cross between lobster and crawfish. Moving to the second course, we tasted a lobster stock risotto studded with cuttlefish and garnished with squid ink powder. 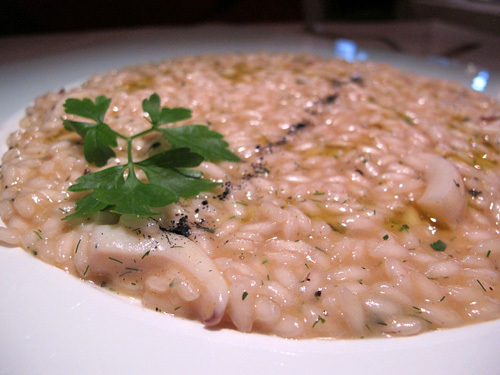 The dish, like most dishes in Italy, was finished with a drizzle of extra virgin olive oil. It’s a trick I’ve since incorporated into my own cooking. 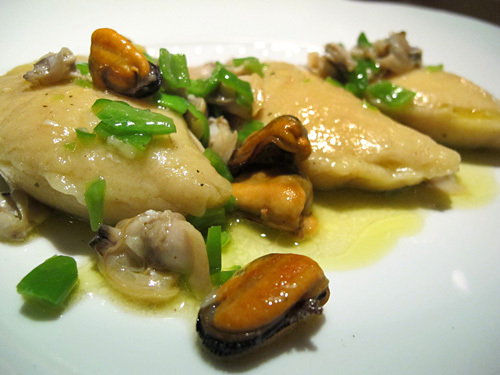 We also tasted handmade ravioli, stuffed with wild herbs and ricotta and garnished with clams and mussels. The three fat pillows would have been a substantial meal on their own. 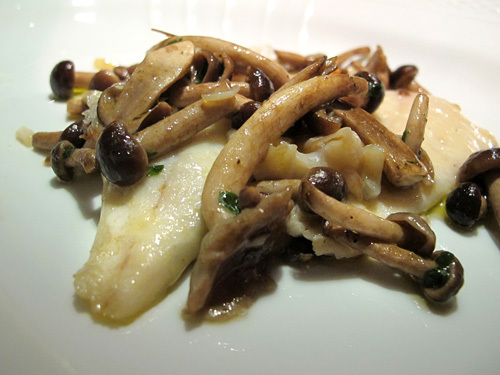 Our third courses were equally filling, although a mushroom topped sea bass was lighter than the other third course. Two baby squids stuffed with potato and zucchini, with a salsa of sweet red peppers and green peppers, were garnished with tiny clams. The squid was a pleasant chewy counter point to the soft potato filling. At this point, I didn’t think I could eat another bite but that’s before I saw the desserts. 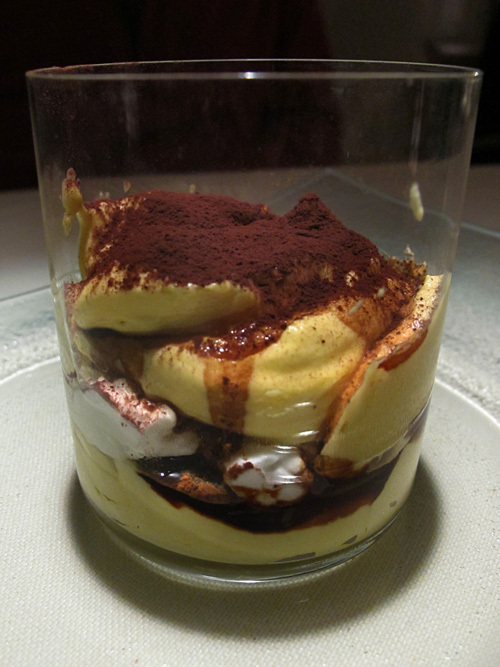 First up was a deconstructed tiramisu, served in a glass with a heavy dusting of rich, dark cocoa. The Marsala flavored mascarpone cream must have contained a dozen egg yolks, it was so rich and golden. But it was the last dessert that wowed me. Maybe because it was so simple or maybe because I’m crazy about pistachios. The pistachio cake, obviously baked in a mold, was crunchy on the outside, and dense, moist and rich on the inside. The batter probably contained both ground pistachios and chopped pistachios — it was the very essence of the pistachio nut. 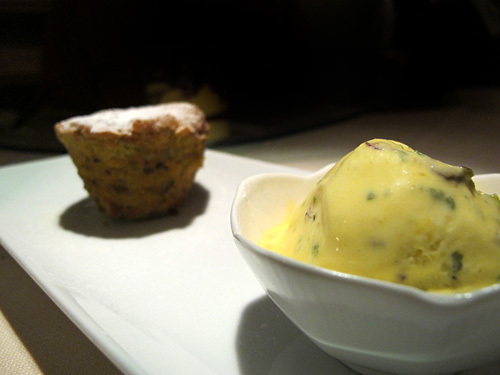 The gelato tasted of rich vanilla — egg-rich French vanilla — and had plenty of texture from the chopped, roasted pistachios. With the exception of the storefront, nothing about Il Ridotto was understated, yet nothing was over-the-top flashy, either. No molecular gastronomy, no bells and whistles, just beautifully crafted dishes with ingredients that tasted fresh-plucked from the ground and sea, served by a humble chef in a chic, elegant setting. In a word? Squisito. Put on your eatin’ pants. It looks like 114 Phoenix restaurants and 43 Tucson restaurants are participating in Arizona Restaurant Week, September 18-26. The participating restaurants have put together three or four-course prix fixe menus, some with extras thrown in, priced at $29 or $39, excluding tax, tip and beverages (unless noted otherwise). If you’re headed to Tucson, eight of the 43 restaurants are offering $19++ menus. Given that Restaurant Week is dinner-only, you have nine dining opportunities. How will you spend them? Restaurant Week can wreck havoc on your good diet intentions, but it won’t if you hit up these restaurants. Calistro California Bistro ($29++) even has some gluten-free options as does True Food Kitchen ($29++), and TFK is tossing in a hummus starter, too. Ko’sin ($29++) at Wild Horse Pass has the local veggies down pat, and we’re even putting Roka Akor ($39++) in this stealth health group because they’ve got butterfish tataki and grilled salmon on the menu. It’s no secret we have rock-star chefs in this valley, and three of the hottest chefs are serving up foodie dream menus for restaurant week: Josh Hebert at Posh Restaurant (the ORIGINAL improvisational chef; $39++); inked Chris Curtiss at noca Restaurant ($29++), and Aaron Chamberlin at St. Francis ($29++). We’re including the original *hot* chef — Mark Tarbell — on this list, too. (If you don’t remember when Tarbell was the hottest chef in town, perhaps you should stick to the Fun & Funky category.) Tarbell’s ($29++) simple menu only includes one choice for each course, but his butterscotch tart with caramelized pancetta might be worth the trip alone. We would have recommended FnB, Renegade Canteen or Christopher’s Crush, but all three are conspicuously absent this year. Maybe that’s a statement in and of itself. Also, if you’re hoping to snag a glass of wine included with the price of the meal, you might want to consider 5th & Wine ($29++) or recent “Best Comfort Food” winner Cafe ZuZu ($29++), but, oddly, Cheuvront’s Wine Bar doesn’t include vino. Really? Go figure. In all, 27 of the 114 Phoenix restaurants are throwing in a glass of vino with the deal. Regardless of your ultimate strategy, you’ll want to make a reservation as the ones we’ve listed are likely to fill up fast. And remember to be a good diner, too. Don’t ask for substitutions (you can do it, just this once) and tip well. So, put some elastic in your eatin’ pants and let the feasting begin.